I wore out the fast forward circuits on my reading device. 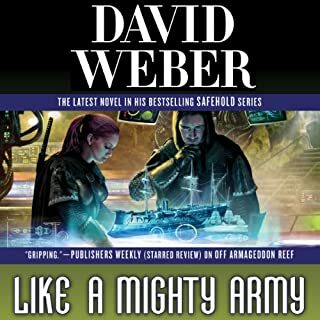 I write as a David Weber fan of long standing so I would like it said I wish I could say this was a good book. The quality of Webers work has been in a steady fall for years now, a combination of disinterest in his own series and the lack of anything resembling good editing. This book follows no single character or plot and send to have no real driving force. 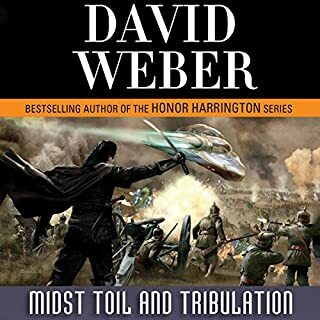 The story is just one big intermission as both sides in the conflict build up for the next big clash of armies inter spaced with contrived wins and losses for both sides so the players can all be in the correct spots for the next book. As well as try and head off a inevitable complains of invincible protagonists buy showing they to can be hurt but is such a way that all it does is delay the plot for another book. Beware at this pace it will take 35 more books for them to get the technology to beat the aliens. a lot more action as in the first seven books. There is now to much dealing with where people come from and how they got to be where they are now. I personally would like David to get on with the story of the war with the church instead of all the sideline chatter. 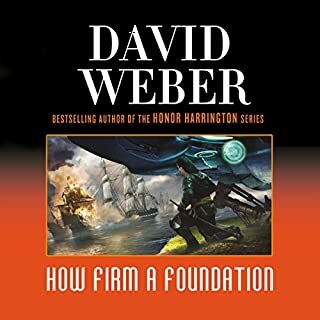 Has Hell's Foundations Quiver turned you off from other books in this genre? It is starting to turn me off, as I have enjoyed the action in the earlier books. This book there is very little action and the main characters are being forgotten. Did Oliver Wyman do a good job differentiating all the characters? How? He did indeed do a good job in the telling of the story and the characters. Disappointment in that the Charisian army is not at the gates of the temple by now. Do you have trouble sleeping? Is your blood pressure really high? Do you like science fiction and fantasy but are tired of all that action and good story just getting in the way? Then do I have a story for you!! Seriously, the story here isn't bad at all. Much detail without going overboard and spending a chapter talking about the room someone is in rather than what's being said *cough*WheelOfTime*cough*. BUT, the story just never seems to go anywhere either. Yes there is this great potential for one, good characters.....but, honestly I was nodding off. And I like large books! I work 10+hrs a day so the larger the better....but I had to lay this one down about half way through. And I've read Homer and Dante (not audio), and those stories were like being at Marti Gras by comparison to this. If you are into the series this far, you will appreciate the talent of the narrator to keep the wandering and at times unfocused plot alive in your mind. The story could have benefited from sharper focus and faster pacing. Plot aside, Oliver Wyman is the only person I want narrating this series. He has a rich stable of interesting voices, each distinct enough to identify character, rank, and nationality easily. The plot was all over the place but the journey was a delight on the ears. or his ghostwriters are getting paid by the word. A bit plodding with details not enough plot. 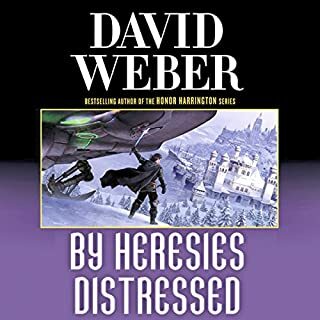 I really enjoy most of David Weber's books, but this series is starting to feel like its just being stretched out for no reason. The descriptions and dialog are wonderful as always, the moral dilemma is very interesting and allows for character growth in realistic ways. Unfortunately this is only a tiny part of the book. The rest of it is a dizzying barrage of minutiae. It feels as if every time a nameless soldier on either side of the conflict dons their coat, a chapter must be devoted to this. As much as I like and respect the author I feel that he has gotten bogged down in his own creation and has to elaborate on far too much. It makes for a very bloated book that is easy to skip ahead and not miss any of the actual story. 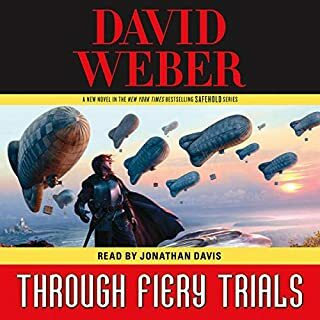 Would you be willing to try another book from David Weber? Why or why not? I would, and will. I may give most of this series a pass. 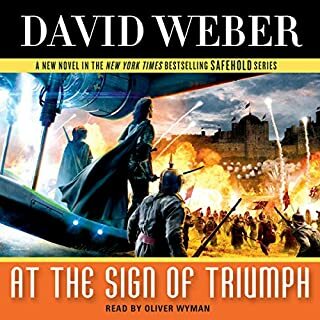 David Weber is very talented writer, but I feel like I could simply wait until the series is finished and just read the last book for all of the relevant details. He is one of my 'go to' readers when I am looking for new things to read.Oliver Wyman is very talented and knows how to keep all of the characters separate and easily identifiable. I give him five stars because Audible won't let me give six! 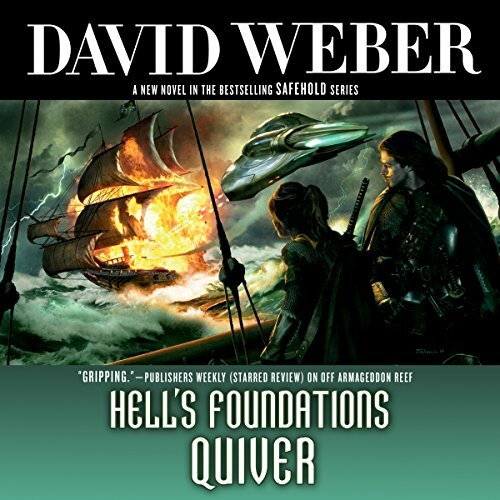 Could you see Hell's Foundations Quiver being made into a movie or a TV series? Who should the stars be? If you enjoy a great deal of detail, particularly about mechanics, manufacturing, and how a little "future knowledge" can impact a more primitive society, then this book has a lot to offer you.If you want to see a plot unfold then you could probably read the jacket of the next book in the series and be caught up with the story. ... but continue the exciting journey on Safehold with all the characters you've grown attached to (plus the ones you love to despise). Quiver the foundations of Mother Church, and the mechanisms both bold and subtle of Merlin and his growing cohort continue to dismantle confidence and swerve loyalties in their direction. It's a fun ride albeit a bit slow in the battles scenes (not my personal favorite parts, but many listeners love battle strategies). Thoroughly enjoyable. Now, how long do I have to wait for the next installment? !